Join the Ma Squad for a special three-hour kirtan workshop on Friday, April 13th, from 8 - 11pm. 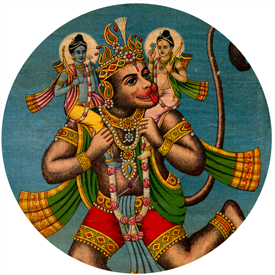 The evening will focus on the Hanuman Chalisa, with one hour of teaching on the meaning and pronunciation of the prayer, followed by two hours of chanting, led by Ambika, Lily Cushman and Shyama Chapin. Each kirtan wallah will be sharing her own connection and understanding of this unique practice, and leading her own melodies of the mantra. The Hanuman Chalisa is a 40 verse prayer singing the praises of the monkey-god, Hanuman. Hanuman is thought to be the embodiment of service and devotion, and it is said that the practice of singing (or reciting) the Hanuman Chalisa invokes these qualities in the practitioner. Ambika, Lily and Shyama are all longtime practitioners of this chanting practice, and are coming together for this workshop and kirtan to share their deep connection with others. Doors open at 7:30pm. You are welcome to come and go as you like throughout the evening. Vegan Prasad will be served after chanting completes. Suggested donation is $10 - $30.